There are few better places to take in a sunset than in Colchester, overlooking Malletts Bay. And there aren't many better views thereof than the one at 97 Blakely Road. But for years, the food at the series of restaurants that filled the space didn't match the location's natural splendor. 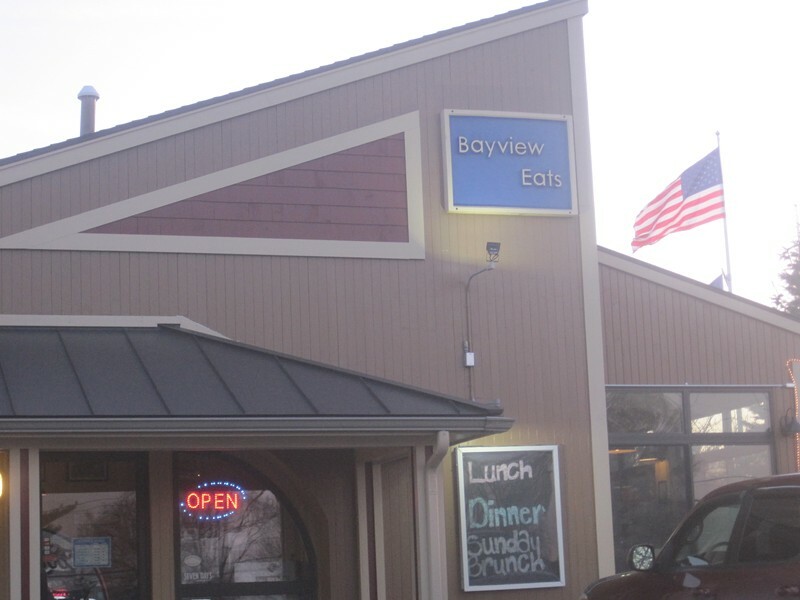 Bayview Eats has been well on its way for a few years, with handcrafted sandwiches and some of my favorite brownies around. But under the guidance of new chef Jonathan Turner, there's now far more to get excited about than lake views and baked goods. Like this, for example. Colchester foodies have long had to leave town for a dish with much more sophistication than a burger. 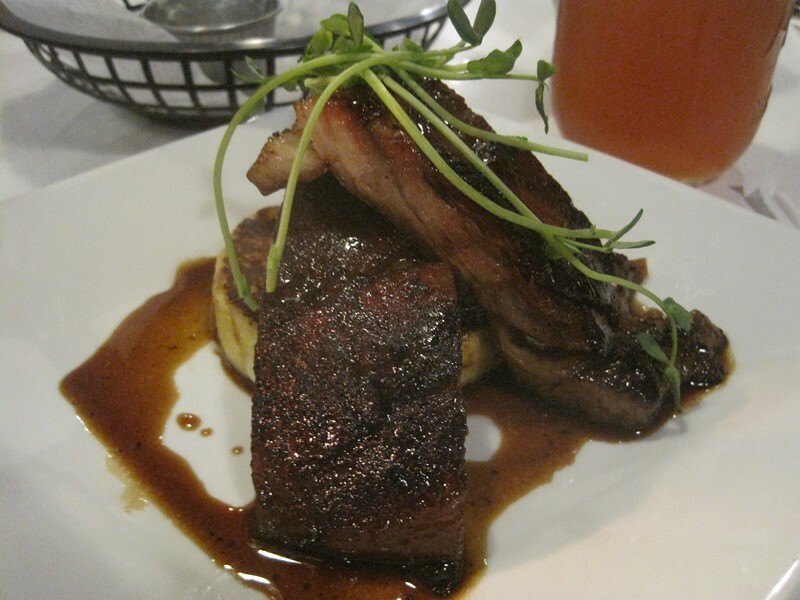 This $10 small plate of pork belly was a revelation for one sophisticated local to whom I spoke the evening I visited Bayview Eats. The dish would not have been out of place at a fine-dining restaurant, but I dug into it just feet away from the creemee machine that will be pumping out dessert as soon as the weather warms up. That mismatch of food and location made the dish seem even more special — a hidden treasure. Not that it was perfect. One of the two slices of local pork was rendered far less effectively than the other. Like Jack Sprat and his wife, one slice had almost no excess fat; the other was mostly adipose tissue. But what was good was very, very good. The tender meat was slightly sweet with a bourbon glaze, which offset an intensely cheesy disk of chipotle cheddar grits. Pea shoots lent a welcome reminder of the oncoming spring. 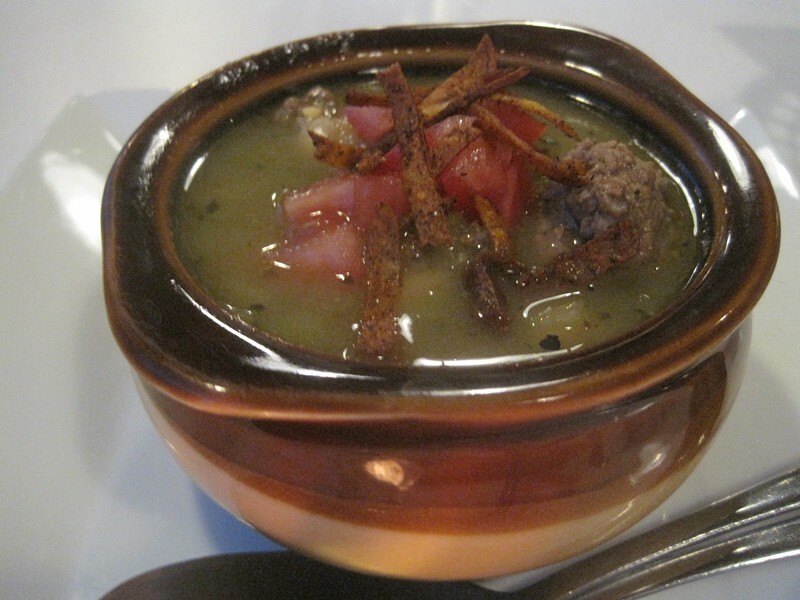 That pork belly was a special, but southern boy Turner's chili verde is newly on the regular menu. It's a dish that's underrepresented in Vermont, and I was pleased to find it at Bayview. Unfortunately, it was a bit thin for my taste. A touch more acid and heat would have enlivened the meaty broth, too. But no complaints about the fried ribbons of potato on top. The crunch was a fun touch that I'd appreciate on, well, everything. Though hearty country dishes such as bacon meatballs and chicken-and-biscuits were tempting, I couldn't help but go with another special. The rotating menu is where Turner is showcasing his more eclectic dishes, at least for now. 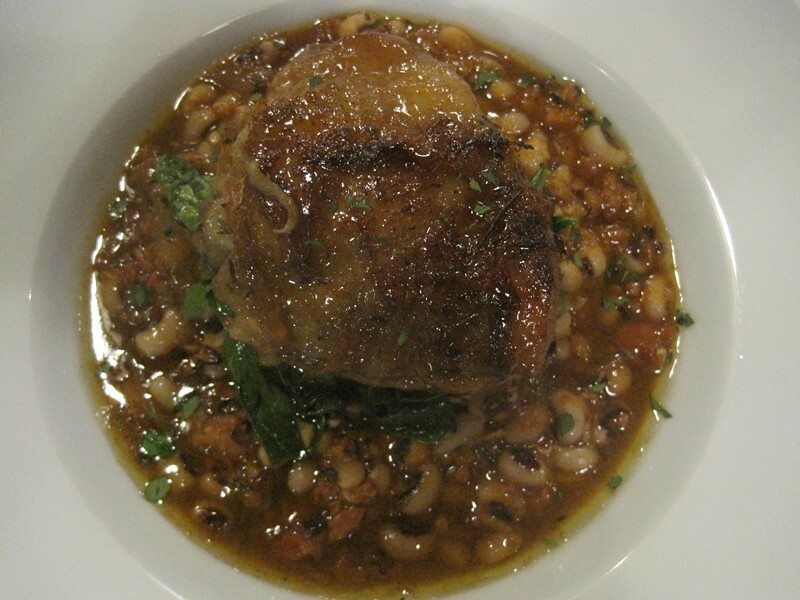 When I visited, it was a no-brainer to order the $15 dinner special, a meaty braised chicken thigh served over an impressive pile of black-eyed peas. The skin of the tender bone-in chicken was cooked to a light crispness but lost some of its crunch with a douse of smoked maple syrup on top. The smoky maple matched the beans, which got their own woody waft from a healthy dose of chorizo. The sausage was delicious, but left the bean stew oily, as you can see at the edges of the plate above. A pile of tender spinach helped break up the heaviness of the dish. With a few minor tweaks, though, this special would be very worthy of inclusion on the regular menu. Between those dishes and a bread basket with an irresistible herb-flecked butter, we didn't really have room for dessert. But that didn't stop us. 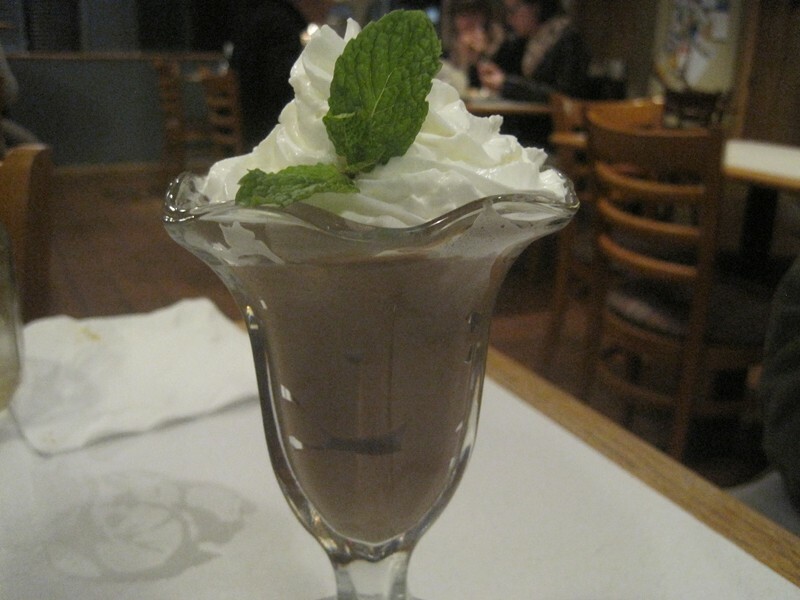 The chocolate mousse was exceptionally light, which made it all the easier to down without even knowing what had happened. Before we realized it, the creamy dark-chocolate concoction was gone. But no matter. Whether it's for bourbon-lacquered quail with chorizo-apricot stuffing or duck sausage with arugula, sour-cherry-balsamic preserves and cave-aged blue cheese in yuzu vinaigrette, I'll be back.